It was 1997, dangerously close to Christmas, and I stood in front of a wall of expensive looking boxes at our neighbourhood toy store. I was stumped. 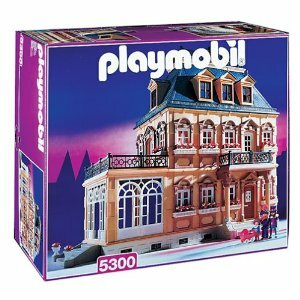 Should I buy the Victorian dollhouse for my toddler, soon to be three? It was sturdy, gorgeous, with a hefty price tag; smaller than the mortgage we had just secured for our real house, our first, but still a stretch. Nearby, a young girl, whom I guessed to be about nine years, pointed to a box of dollhouse accessories. “Do you like that dollhouse?” I asked. She nodded and smiled. Her mom was happy to share. Her nine-year-old adored the thing and played with it ahead of any other toy in their home. That was it then. I could expect six years of play value. Not bad. There were no buttons, batteries or flashing sirens-even better. The girl and her mom were still trying to choose which accessory to buy as I plunked the cash down on the counter. We didn’t get to the box until late Christmas Eve. Santa put it together with some help from the IKEA curse word dictionary. There were shingles to place, buds to plant and tiny spats to adorn tinier feet. I don’t recall when we went to bed but we all staggered down a few hours later to see Santa’s stash. The dollhouse stood in the centre of the floor with a three-inch family and servants alongside, a Downton Abbey for miniaturists. 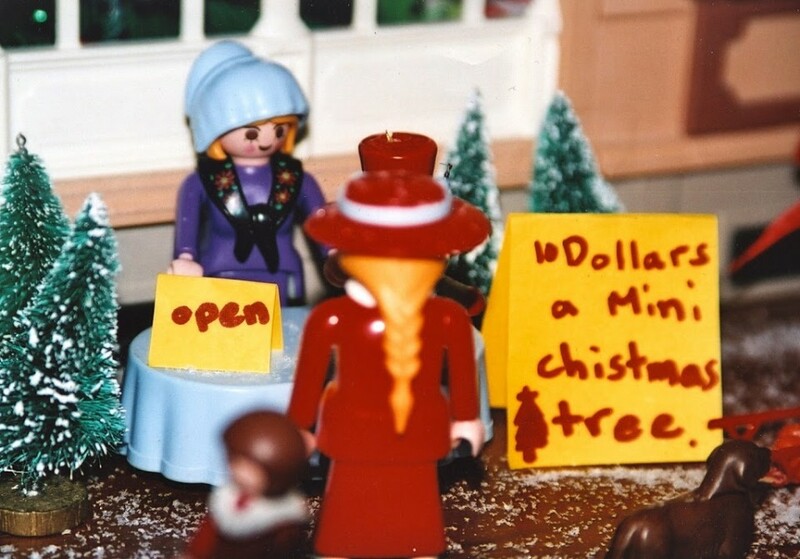 Kate picked up one of the figures and began to name them. Every bedtime story was re-enacted. The figures became totems for elaborate narratives that sprawled far beyond the confines of the toy house. As she grew up, the narratives grew with her, gaining wit and irony with some pathos for good measure. Fortune magazine may have named Lego the toy of the century in 2000 and we certainly tripped over those pieces in the clutter over the years. 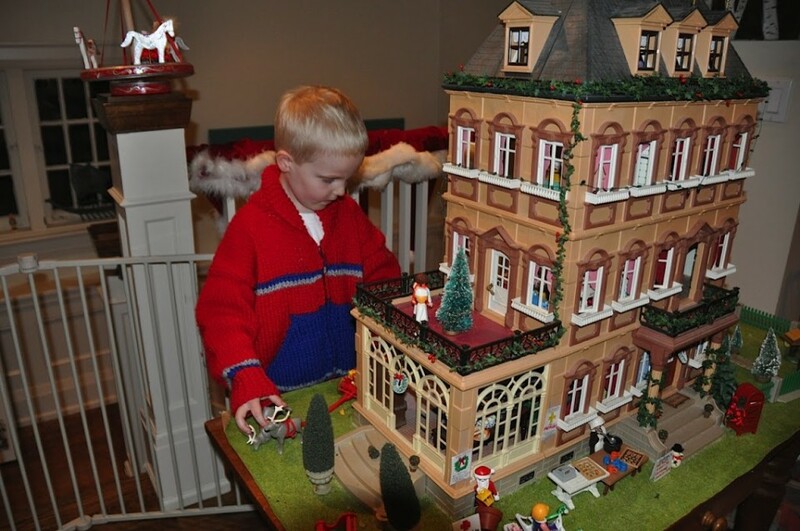 But it was the German made dollhouse figures that took up permanent residence. The dollhouse has moved from bedroom to playroom to our tiny library upstairs. Neighbourhood kids never leave without a peek inside to see the latest drama. A barrage of books soon moved the dollhouse again, this time out to the second floor landing where it stands today, the Great Childhood Relic That Won’t Leave. The toddler will be 18 in March. Most of the toys have been given away or packed up in storage for future grandchildren. My kid passes by her dusty old play toy, en route to the cesspool known as her bedroom. 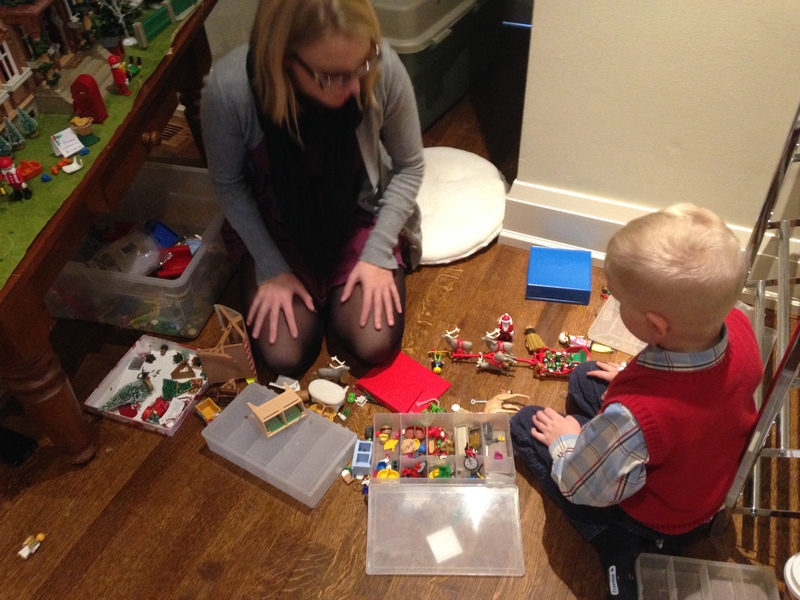 She can’t clean her room but the dollhouse is an easy fix:it helps to have younger cousins. Spring window boxes are filled when the calendar turns. In October, it becomes a haunted house. The halls at Christmas are decked with homemade embellishments. I’d like to thank that unknown kid from the toy store. She unleashed a beast of invention. Why not a reenactment of a favourite musical? Made by a dollhouse-lover-for-life.